Shiny, strong, classy and elegant. Organza is a thin, plain weave, sheer fabric. 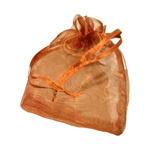 This delicate organza bag allows you to see the gifts and treasures inside. An easy ribbon drawstring closure allows it to be tied shot. Organza bags are commonly used for packing gifts, crafts, cosmetics and jewellery.